It is with immense excitement that I am now able to say that my next book will be out in September of this year, from the ever-supportive Civil Coping Mechanisms. The most gratifying part of saying this is what the book actually is, what it represents as a part of my writing life. Over the years I have talked about my collection of Alaska stories. That is this book. 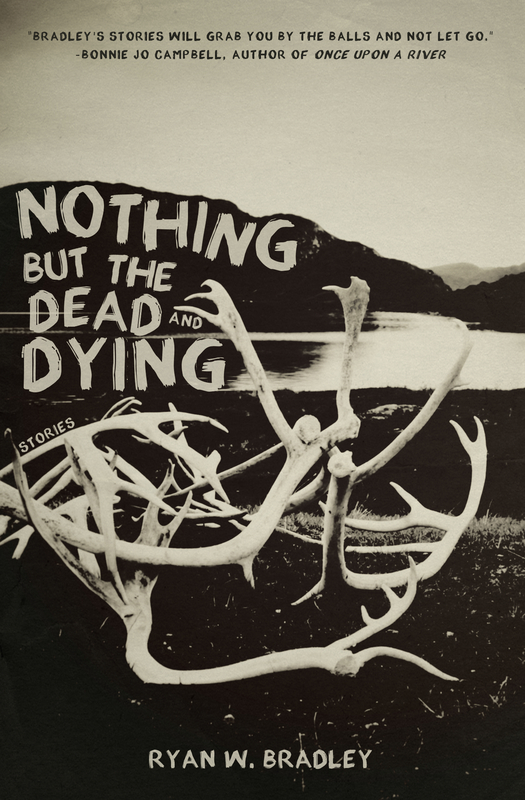 It is called Nothing but the Dead and Dying. It is a book that houses every ounce of my soul. Its publication will mark the satisfaction of a long, and often harrowing journey. When I started the second semester of my MFA program, I met with Craig Lesley, the faculty member I would work with for the semester and he asked me about my background, about the stories I wanted to tell. I told him I wanted to write about my time doing construction in the arctic, but that I didn’t know how. From there a few more stories came in quick succession, and when I wrote a story called “Glaciers” I knew I was a different writer than I had been before. About a year later I had finished another six stories and had a manuscript I felt good about. It was a slim volume of stories I killed myself for, and I began to query small publishers as well as agents. As is (incredibly) normal, I was greeted with a slew of rejections, many of them being incredibly kind and supportive. One editor called it a masterpiece (looking back, I can’t help thinking how wrong they were, for much would change over the following years). More than one agent and editor told me they couldn’t sell a story collection either to publishers or readers. Meanwhile more stories were coming out of me. So I continued adding to the manuscript and six months later sent out another wave of queries. Several publishers expressed interest, but, without getting into specifics, that interest disappeared one publisher at a time. Still, I kept writing. The manuscript kept growing. Stories continued being published here and there. Seasons turned into years. Friends read the manuscript and gave me advice. All in all, four different versions of the manuscript made the rounds in various waves of submissions and queries. Then another publisher showed interest. This time a seemingly significant interest. An editor, Dawn Marano, was hired to work with me. And for another year I worked on revising the stories I’d been writing and editing for five years. It was a rewarding experience, even as exhausting as it felt after bleeding for so long. When we finished I was confident and nearly giddy to send it back to the publisher. But ultimately they decided they didn’t want it after all. It’d be a lie to say I wasn’t crushed. For the thousandth time. I think most artists have the objectivity to tell you when something is truly their best work. There is a different feeling in it, from infancy to completion. And I knew that about these stories every step of the way. For six years I’d championed not just words I had compiled into stories, but my heart. I never stopped believing in the stories, but I’m not ashamed to say that many times throughout those six years that the experience made it hard to believe in myself as a writer, a hole I am still trying to dig my way out of. I am also not ashamed of having an ego, nor to say with all honesty that I believed this manuscript was the work that would bring my writing career to a different level, that if, decades after I cease to exist, people were going to remember me, it would be for this book. When CCM expressed interest in doing another book with me I asked if they would look at the Alaska stories. And now the rest will be history, even if only personal. Maybe I will never ‘graduate’ to another level in terms of my writing career, maybe my books will never be remembered. It’s pretty audacious to imagine either could even be possible. One thing I know is nothing else I ever write will make me as proud as the stories in this collection, that if I die without ever writing another word, I will be proud of what I accomplished while calling myself a writer. Artists are told to bleed for their art. We are told to leave it all on the page, canvas, what have you. Too often that ends up including our mental and emotional health. That is what I have done with this book. Everything I have to give as a writer, whatever that amounts to, is in these stories. If you read the book this fall, I hope you feel that on every page.